I have two children. Two lovely children that I gave birth to. I am fortunate enough to have lots and lots of other kids that I call my own. My husband and I worked with young people for twenty years. We had the honor of watching so many kids grow up from awkward middle schoolers into interesting adults. We worked with a lot of young people over the years, and they all took a little piece of our hearts. This time of year the graduation announcements start rolling in and I always get a little nostalgic. This is my letter to all of those young people. I spent a short time with you, but your presence in my life has been a lasting gift. God called us to work with young people and I was blessed beyond measure to be called to love you. Yes, you. John got to do all of the planning, paperwork, and office hours and I got to be the volunteer. I loved you when we laughed together and I loved you when we cried together. You might not believe me, but I loved you even when you were being a butthead. I was honored to know you even when I knew way too much about you. I was honored when you shared your dreams with me and when you shared your broken hearts. Oh how I wish we could escape adolescence without a broken heart, but I'm not sure it's possible. I know that you might think I don't remember you, but I do. There are so many quote boards and funny stories. We have had charts to keep track of how many times you washed your face and charts to make sure you showered at least once on the weekend. I will always smile when I think of you trying to pull off falling down the stairs and I laugh out loud when I think of all the fun we had with the fart machine. I still can't believe you were brave enough to endure blindfolded Fear Factor Snack and I really wish you weren't brave(stupid?) enough to break a bottle over your head. I love that for a year you spoke to me only in movie quotes and I seriously love that you got my daughter to potty train herself so you would babysit for her. I love that you put all of the dishes in the dishwasher right side up, and I love that we got to teach you how to do laundry. And I love that I can still kick you in Speed, except for you, you know who you are. I love that you taught me so much about faith, and will always be grateful that you shared your faith with me. You have grown up so much but you are still becoming who you are going to be. There is so much I would love to say, and I know it's been said before, but here is my top ten. Always Love. The world will try it's very best to make you cynical. Always Love. Speak the truth in love. You will have difficult things to say, say them with love. Keep learning even when you think you're done. Being smart means nothing without heart. Somewhere in this post, it became a Top Ten Tuesday post! 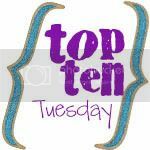 Go to Oh Amanda to see other Top Ten Tuesday posts about a variety of topics! Oh how lucky to be loved by the Hodges! You are a beautiful writer and knowing you and John makes this post that much more touching ~ what awesome work you have done and I hope God chooses to bless another generation or two of kids w/ you as the amazing guardian angels they never knew they had. Blessed! What a beautiful letter! Bringing up children really is a very special experience! I'm loving every minute of it with my 2 girls!! Just stopped by from Tuesday’s blog hop. I’m following you now and hope you’ll stop by my blog sometime too! Have a lovely week. Hi Anon from the UK, I will be visiting. And you too Jill, looking forward to checking out your blog. I'm bookmarking this and saving it for my sons. Their graduations are years away, but it will come before I know it. Thanks for something positive after the tragic teenage stories coming out of Raleigh this week. awwww *tear* ... thanks so much for posting this.. this would make a great plaque. Thanks Ilina and Samantha. It's such a mix when they start to become their own person. We know how dangerous the world can be, and they still believe they're invincible. Just start talking now and don't stop!!! It's a great thing I waited a few weeks to read this! God blessed our children with your influence in their lives even when they, and possibly we, didn't appreciate the words out of your mouths. I mean really.... Thank you for 'loving up' the youth you and John helped guide thru some incredible opportunities...and for continuing to love them/us! Oh Amy, I love this list. Love this letter. This'll be me next year with our oldest, I canNOT believe it.